Hey everyone. How are you all doing? Right now I have one of those pesky eye twitches on the upper eyelid on my left eye. You know the ones, right? Those involuntary twitches are meant to be a sign of tiredness, but that wont stop me staying up late to paint my nails again. 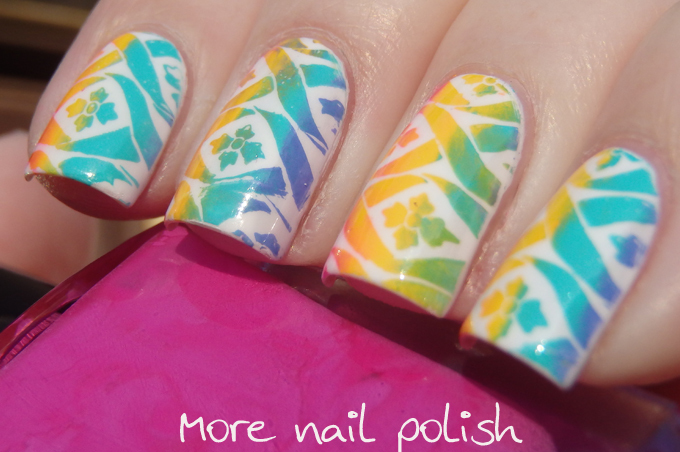 Here is my latest rainbow mani. 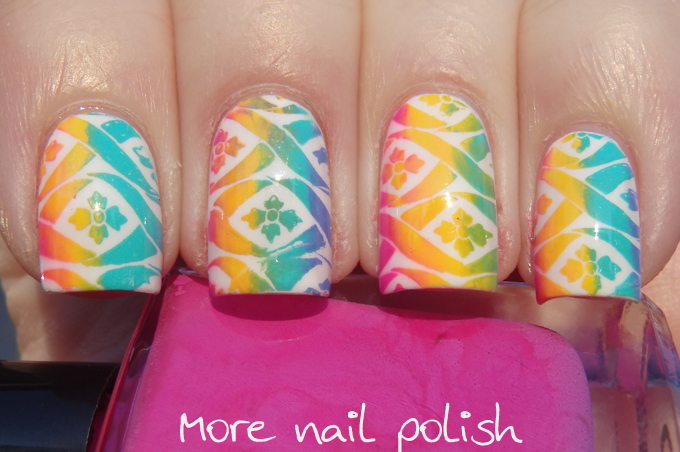 I used some of the awesome Mundo de Unas stamping poishes to create a rainbow stamp over a white base. I love that it's nearly impossible to tell if it's a rainbow stamp over a white base or a white stamp over a rainbow base. I did a quick instagram tutorial video and have embedded it below for your 15 second viewing pleasure. 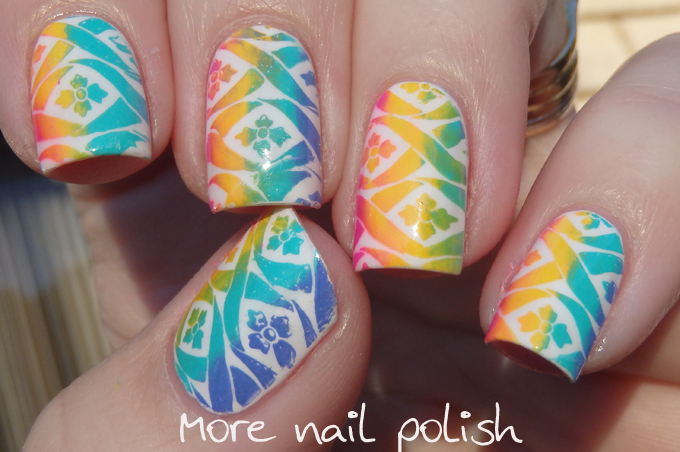 WOW, I thought you did your stamping with a white nail polish ! It's incredible ! Awesome! And this is way easier than painting one's nails in rainbow colours first! You did a marvellous job with the stamping/tutorial/design/video - in other words, everything!!!! 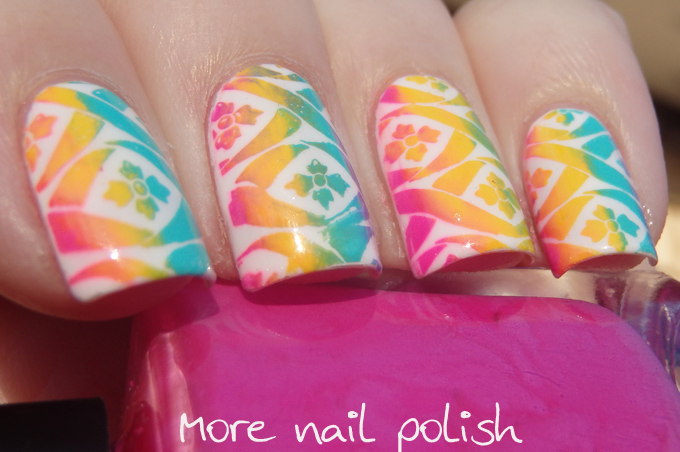 I tried rainbow stamping a couple of times and it was a colossal disaster haha. I should try again! This is gorgeous! I keep holding off getting them, but I really should break down and by the Mundo de Unas stamping polishes. Beautiful design. I have heard those stamping polishes are The Best!